Coffee stirrers are meant to stir coffee, not to be made into baskets. Bored on a coffee break between playing sessions at Bennington, I was irritated at how bendy the wooden coffee stirrers became when they got wet. And I thought, “you know, I bet I could make a basket out of these.” Somehow, I convinced esqg that this was actually a good idea (note: as you will surely soon see for yourself, neither of us knows the least bit about basket-making). Anyway, we found a bowl, got some hot water from the tea urn, and soaked a bunch of coffee stirrers. Soon we had a nice little 2″ x 4″ section of woven basket, no problem. Of course, coffee stirrers don’t get any longer than 4″. But what to do with it? On the theory that if we staggered the stirrers (which we hadn’t) we could weave more stirrers in and thus enlarge the project, we took it apart and started over. This time we left some room on the edges of the “warp” stirrers, and managed to weave in another set in, and another. By this time, some of the stirrers, perhaps insufficiently soaked, perhaps just faulty (they were only coffee stirrers, after all), were starting to fray where they’d been bent. But we pressed on, and managed to complete a circle, four stirrers deep and 18 around. But baskets have bottoms, so we set to work trying to connect the free ends of the 18 stirrers to make a bottom. We ended up taking groups of three evenly spaced around and interlocking them so as they’d hold together. This at least gave the basket a bottom, if not a particularly nice looking one. Then we wanted to add more substance to the bottom. Since coffee stirrers don’t bend widthwise too well, we broke some in half and stuck them in–rather haphazardly. At this point, our hands were getting wrinkly, and the basket was starting to fall apart as much as it was being put together, so we decided to leave it at that. Not bad, for a first attempt, given coffee stirrers as materials? Well, pretty bad. But it was fun and, perhaps more importantly, disabused me of the notion that making a basket out of coffee stirrers would be a good idea. We finished the tapestry this weekend! We’re still pretty obsessed with it, and want to share. We finished weaving on Thursday night, closing in the last bit of wing around the shoulder. For the most part, I had been working top to bottom while esqg worked bottom to top; however, for this last part, we divided it into horizontal sections (the arms; the belly; the horizontal wing feathers; the feather tips) and coordinated the closing of the gap for each. The constraints of space, in combination with the coordination task, entailed various extreme measures, including esqg’s stitch-by-stitch plan of the lower claws, and my schematization of the wings in rows 1-12 (with my 1 equal to esqg’s 12, for added excitement). And then the last stitches were set in place (cramped in some places and loose in others, despite our continuing efforts to keep the lines straight) and we had before us a completed double tapestry! It’s amazing, really, how different a tapestry looks when it’s done than when there’s even a little bit left to be woven. All the mistakes you remember making fade into insignificance before the perfection of the whole. And despite the many compromises and rash judgements made in production, there’s a sort of magical determinism about it–as though it could never have been any other way. Esqg interjects: we always joke about how the creature is going to come to life when we finish weaving. Then came the Ordeal of the Paranoid Knots. We had to cut the tapestry in half along the space we’d left for it, and although spare string was generously allotted in the middle, as the curve grew steeper at the top and bottom the space between the two tapestries shrank to millimeters. Hence: Paranoid Knots. We tied off every raw edge in the middle of the tapestry before cutting it out. I’m not going to describe the process–I don’t want to write about it any more than you’d want to read about it. Fortunately, our experience with the Dragon Tapestry had taught us that similar precautions were unnecessary at the edges where the warp threads ran through the frame. esqg was moving out this weekend, and her sewing kit had gone back to Princeton. Fortunately, silkspinner was in town to help her move, and she had brought a pair of tiny embroidery scissors. With those, along with some sharp kitchen knives, we hacked our tapestries out of the frame and separated them. After that, it remained only to line the tapestry (with green cloth) and edge it with (very green) ribbon. Fortunately, we were able to call upon the benevolent assistance of the costuming guru of the UtenEva LARP–silkspinner, once again. We sewed a couple of ribbon loops to the top, and the project was complete! I’ve been working on the top (the eagle part); esqg on the bottom (the lion part). I’ve been working on the wings, and (in the pictures esqg posted yesterday) am just about to start working on the head. Esqg, meanwhile, has been navigating a dense assortment of legs and tails, and has just finished the tuft of hair at the tip of each tail. By measurement, we’re about a third of the way done (we’ve spent a ridiculous amount of time this week weaving). On the other hand, progress in inches is likely to start slowing rapidly: I’ve had it pretty easy so far but once I get to the head, things will start to get, well, if not hairy, than at least very, very feathery. The pictures also show the evolution of the s-shaped crack in the middle of the tapestry, which appears to be developing more or less according to plan. The plan is eventually to cut the tapestry in half along that crack (so that esqg and I each get a tapestry to keep), and hem each side with ribbon. I’m confident that we’ll be able to do this, but I’m starting to worry about exactly how. Experience with the dragon tapestry has shown that it’s safe to take a tapestry out of its frame: that is, you can cut the knots on the outside of the frame, and the warp threads won’t rebound backwards into the tapestry anywhere near far enough to risk unravelling the edges. In principal, this should be similar–and even easier, since once the tapestry is out of its frame, the threads won’t even be under tension. On the other hand, I think I hadn’t quite realized how very little margin there’s going to be at the edges of the tapestry. It will presumably be necessary to assure ourselves that the threads on the edge of the crack are well and truly locked to their warp threads before cutting anything. We’ve been making progress! There isn’t much to say about it, except that I now have a proper digital camera so you can see the results. Elisabeth, silkspinner and I have made progress on the gryphon tapestry! We found a small picture of a gryphon online, scaled it up so that it was low-resolution, and traced outlines onto graph paper. We taped enough graph paper together to make a diagram to scale, and scaled up the beginning diagram by the low-tech method of drawing in nine squares what originally was in one. Then we used a lot of our imagination to fill in some details on the main diagram; there may be too many details to cover in the tapestry, but given what we know of the techniques of the last one we think we should be able to manage. We have not yet had the perseverance to reproduce our single gryphon in mirror image on the other side, so we now have half a diagram taped to the back of the tapestry. Still, it can be used! The two pictures here don’t quite fit together; my photography skills are currently limited by my cell phone’s camera. We bought a variegated yarn for the background color, so that it varies between dull green, blue-green, and blonde. We have three levels of shading for the “lion” hindquarters, and three for the eagle, as well as gold and black. When weaving the dragon tapestry we had trouble finding all our threads of the right thickness, so we ended up with some five-ply threads that we had to re-ply (in pieces) into three-ply thread. This time we shouldn’t have to do much of that, though the black thread will have to be divided up. Here you can see the wood frame and warp threads where they appear in the middle of the divide. Since this is the edge, the curve of the divide is especially steep. The overwhelming majority of the color in this picture is supplied by the variegated background thread, but towards the top you can see the bottom of the claws in gold, the lion color, and the lion-shadow color. The splotch of lion to the right is the bottom scoop of the tail. So far we’re at 20 rows on the bottom and 21 at the top! Three years ago, Elisabeth and I decided that it would be a great idea to make a tapestry. There should be upcoming posts from us or the others recruited to the cause; it took two and a half years and had many contributors. It is purple, and features a dragon. In any event, since she and I are living in the same place this year we have decided to make a smaller tapestry together. This time, it will be green, with gryphons! Or griffins, if you must. We spent much of today making the frame and threading it. Here are some differences between this tapestry and the last one: The frame is about 2 feet on a side, coming out slightly wider than it is tall–instead of almost 3 feet wide and a full 6 feet tall. There are just as many (actually a few more) warp threads as last time, however, since they are spaced at 6 to an inch instead of 4 to an inch. Since the weft threads aren’t thinner (Elisabeth thinks they’re thicker), this should make the pixellation of the tapestry closer to square. The most interesting and possibly painful thing about this tapestry is that it will be divided into two parts, each featuring a gryphon to mirror the other. We’re thinking that we may make a jagged or curved border (depending on how you look at it) to show that the two pieces should fit together. This will allow each of us to take one gryphon with us when we part ways in the spring, perhaps for help with traveling (or in my opinion, lie detecting. There are lots of myths about gryphons but one is that it is impossible to tell lies in front of them). To make the frame, we took a piece of wood 1/2-3/4” thick, 2.5” wide, and 8 feet long. We cut it into two 26” pieces for the top and bottom, and two 22” pieces for the sides. We also bought two (we thought only one, but apparently two) metal corner-braces from the hardware store where we got the wood, and used them on diagonally opposite corners. (We learned the hard way that it’s a good idea to brace at least one corner when we made the dragon tapestry.) It might be more stable to brace opposite corners, but this way we could pick our right angles more carefully. The side pieces were inset and the top and bottom nailed over them, because the warp threads will pull the top and bottom inward so we wanted them braced against the side pieces. We made a two-inch-long mini-ruler of 1/6” by marking down to the 1/2” and then estimating. Using a tape measure along the middle of each piece, we made marks for 24 inches on the top and bottom, leaving about 1/4” margin inside of the side pieces. We drilled with a 3/32” bit that broke after completing its task. 😦 Since 1/6″ is so small, we wanted to pick the smallest size we had that would allow the warp threads to pass through. Even so, we had enough trouble drilling the holes so close together that we ended up staggering them above and below the center line in order to keep them farther apart. We’re hoping that the resulting 3-D effect will flatten out fairly quickly once we start weaving. The warp threads are twisted cotton twine, just like last time. On the one hand, we couldn’t have got the thread through the holes without tapestry needles (we got them through on the last tapestry, and did much of our weaving, before Silkspinner brilliantly bought large tapestry needles, but those holes were bigger); on the other, since the only tapestry needles I have are size medium (too small), getting the needles threaded was a production in itself. So each thread did double duty, with a knot at one end, going from one side to the other, knotting in the middle to preserve tension (and in case one half breaks) and going back and finally knotting at the side where it started. That way we only had to do half as much threading and 3/4 as much knotting as otherwise. We’ll update you with more pictures! Especially when we have a real camera to work with. 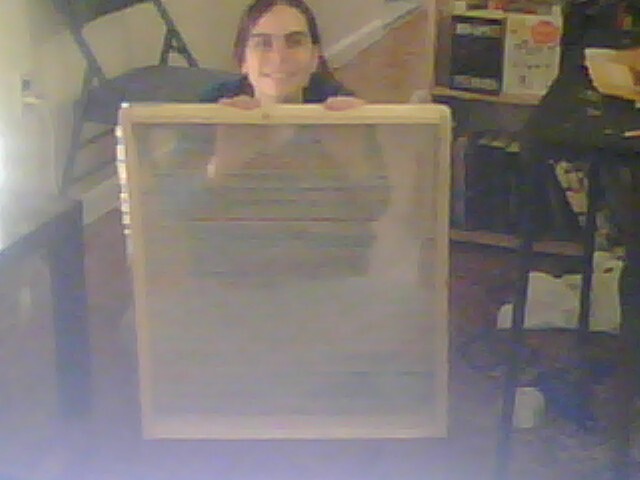 Here’s the nailed-together and threaded frame, with Elisabeth hiding behind it, courtesy of my cell phone camera. The next step is to test out the thread we bought for the background weft, as it’s a unique variegated yarn and if there isn’t enough of it we can’t get more.